Scientists using CSIRO's Australia TelescopeCompact Array, a radio synthesis telescope in New South Wales, Australia, have seen a neutron star spitting out a jet of matter at very close to the speed of light. This is the first time such a fast jet has been seen from anything other than a black hole. The discovery, reported in this week's issue of Nature, challenges the idea that only black holes can create the conditions needed to accelerate jets of particles to extreme speeds. "Making jets is a fundamental cosmic process, but one that is still not well understood even after decades of work," says team leader Dr. Rob Fender of the University of Amsterdam. "What we've seen should help us understand how much larger objects, such as massive black holes, can produce jets that we can see half-way across the Universe." The scientists, from The Netherlands, the UK and Australia, studied Circinus X-1, a bright and variable source of cosmic X-rays, over a three-year period. Circinus X-1 lies inside our Galaxy, about 20 000 light-years from Earth, in the constellation Circinus near the Southern Cross. It consists of two stars: a 'regular' star, probably about 3 to 5 times the mass of our Sun, and a small compact companion. "We know that the companion's a neutron star from the kind of X-ray bursts it's been seen to give off," says team member Dr. Helen Johnston of the University of Sydney. 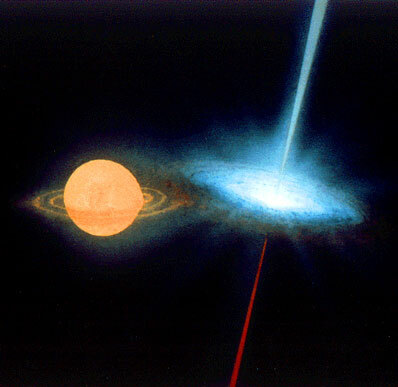 "Those X-ray bursts are a sign of a star that has a surface. A black hole doesn't have a surface. So the companion must be a neutron star." A neutron star is a compressed, very dense ball of matter formed when a giant star explodes after its nuclear fuel runs out. In the hierarchy of extreme objects in the Universe, it is just one step away from a black hole. The two stars in Circinus X-1 interact, with the neutron star's gravity pulling matter off the larger star onto the neutron star's surface. This 'accretion' process generates X-rays. The strength of the X-ray emission varies with time, showing that the two stars of Circinus X-1 travel around each other in a very elongated orbit with a 17 day period. "At their point of closest approach, the two stars are almost touching," says Dr. Johnston. Since the 1970s astronomers have known that Circinus X-1 produces radio waves as well as X-rays. A large 'nebula' of radio emission lies around the X-ray source. Within the nebula lies the new-found jet of radio-emitting material. Jets are believed to emerge, not from black holes themselves, but from their 'accretion disk' - the belt of dismembered stars and gas that a black hole drags in towards it. In Circinus X-1 it's likely that the accretion disk varies with the 17-day cycle, being at its most intense when the stars are at their closest point in the orbit. The jet from Circinus X-1 is travelling at 99.8% of the speed of light. This is the fastest outflow seen from any object in our Galaxy, and matches that of the fastest jets being shot out of other complete galaxies. In those galaxies, the jets come from supermassive black holes, millions or billions of times the mass of the Sun, that lie at the centres of the galaxies. Whatever process accelerates jets to near the speed of light, it does not rely on the special properties of a black hole. "The key process must be one common to both black holes and neutron stars, such as accretion flow," says Dr. Kinwah Wu of Unversity College London, UK.